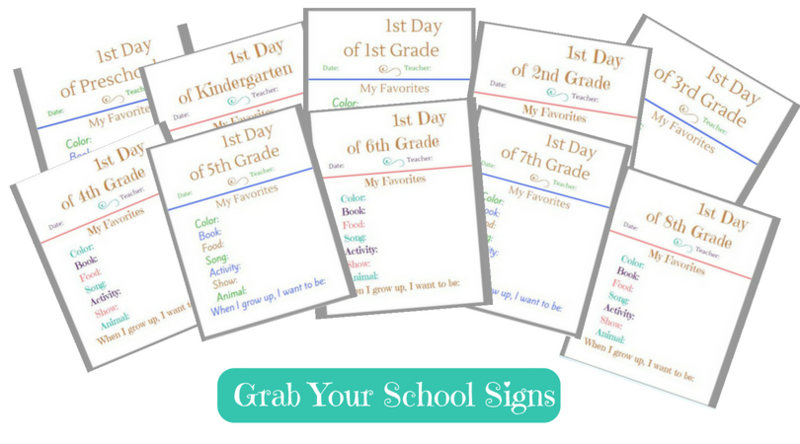 It’s back to school time and I have a set of lovely printables just for you and your children! 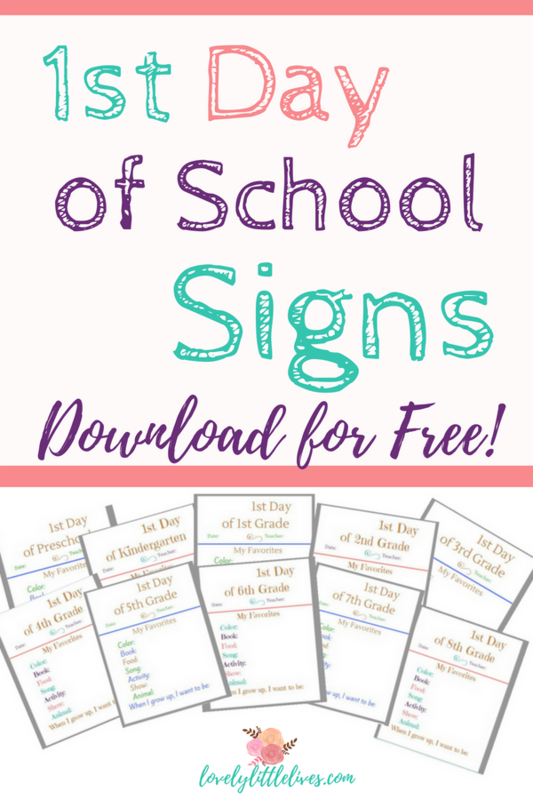 If you like to take those first day of school pictures with cute signs and new outfits, then you are going to want these 1st day of school signs! 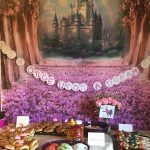 I used a version of these printables for my own daughter this past year for preschool and this year I will be using them once again, now for both of my daughters as they head off to preschool and kindergarten. 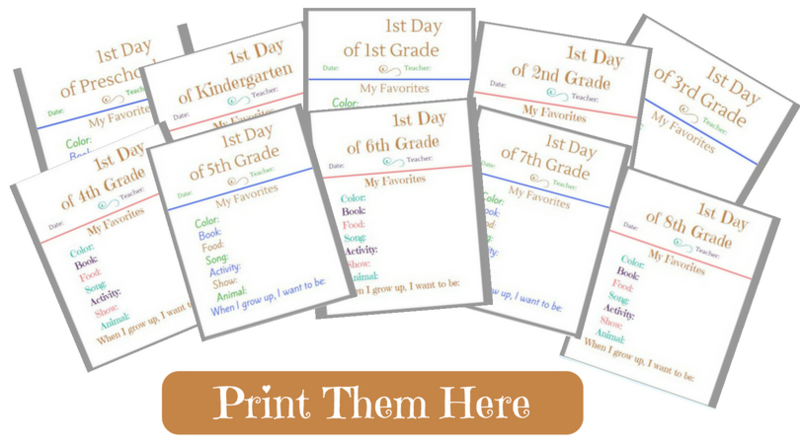 I’ve created a packet of printables for you to use from Preschool to 8th Grade. I tweaked the girl version I already had created for my daughters and created a boy version so that both options are now available. You can either print out one version or both! You can save these and print them out year after year. I suggest printing these out and filling them in before school starts so that the morning of, they are all ready to go. Lay them out on the counter the night before, (right next to those prepped lunch boxes). 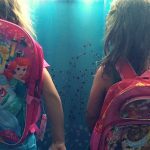 Grab them on the way out of the door and snap those front yard pictures before your kids board the bus or hop in the car. You can either print and use them as they are or you can put them in a frame temporarily so that they are easier for your kids to hold. I did not do this last year, (newbie) but I think I will this year so that the paper stays more smooth and doesn’t crinkle or blow in the wind. Fill these out by inserting your child’s first name at the top and then use the prompts to fill in the rest of the sheet with their answers. It’s always fun to see what they say and how their answers either change or stay the same from year to year. 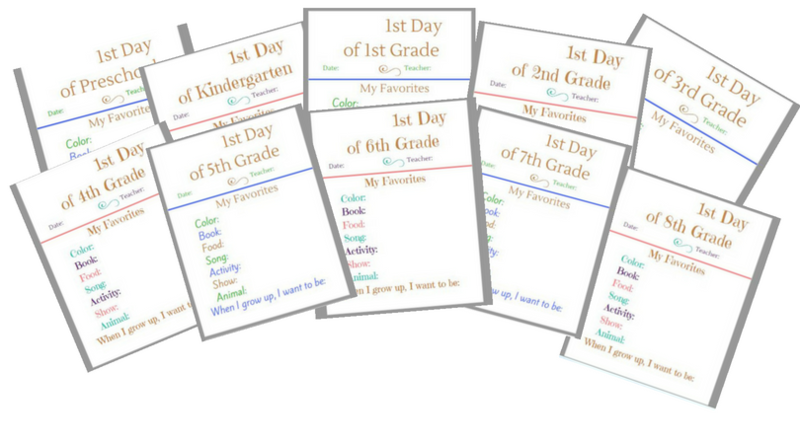 The nice thing about these is that they are a regular 81/2 by 11 sheet so you can save the filled out sheets in your child’s scrapbook or school folder as a memento of their first day of school each year. Have a lovely 1st Day of School!